Winter Bingo is more like a lotto game than a bingo, but my students loved saying "bingo" when they filled the cards so bingo it was! I conducted whole class lessons in my early childhood special education classes twice weekly so four pictures per board were the perfect number for a short, but effective game. Each board was different, but many pictures were similar so students had to look for differences and use more detailed sentences to describe the pictures. My verbal students helped those with less verbal abilities and I was able to take data on a variety of goals. The sample questions below could elicit a simple "I do." or, with modeling and questions, elicit -ing verb endings, increased utterance length, prepositions, conjunctions, negations, plurals, and so much more! Who has the red mittens? Who has the boy that is snowboarding? Who has the boy making snow angels? Who has the blue coat with a hood and fur? Who has the coat with the blue sleeves and a blue hood? Who has snow on a fence? Who has snow on a house? Who has a boy skiing? 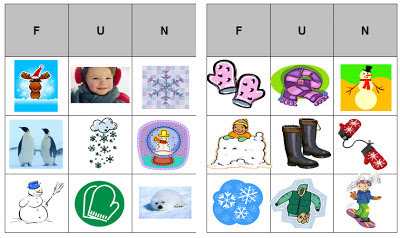 You can download my nine card Winter Bingo set at BoardmakerOnline.com. 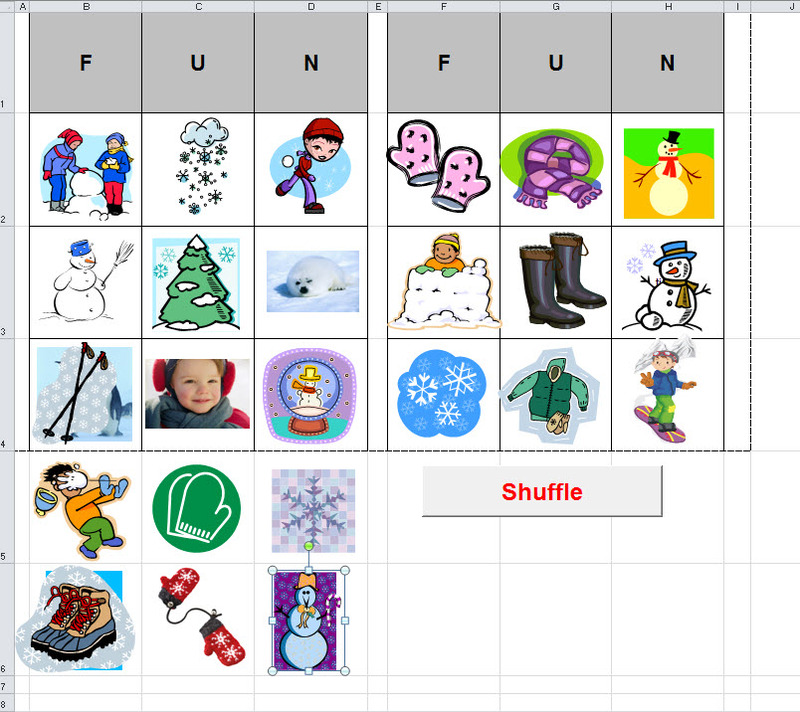 If you don't have Boardmaker, you can download free Winter Bingo Cards (and more) at DLTK. These cards can be printed in both color or black and white. To customize a bingo game, go to UNCW.edu/EdGames and download a Bingo Card Generator. I used the 3x3 generator to make the cards on the left. The actual download uses words, not pictures. The generator is made with Microsoft Excel so I copied and pasted pictures from Microsoft Clipart on top of the words on the Excel document. This Bingo Card Generator has a shuffle feature. Replace all words with pictures (include the words below the two boards) and push the shuffle button to make a multitude of boards.